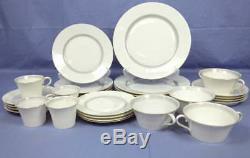 Lot 28 Nymphenburg Adonis China Dinnerware 4 Place Settings Plates Cups Saucers. 4 Dinner plates - 10 3/4. 4 Salad plates - 7 1/2. 4 Bread plates - 6 3/8. 4 Tea cups - 2 1/4" tall and 3 7/8" wide from lip to handle. 4 Tea cup saucers - 5 3/4. 4 Cream soup cups - 2 1/4" tall and 6" wide from handle to handle. 4 Cream soup saucers - 6 1/2. For your consideration are these 28 pieces of Nymphenburg china. The china has been used and does have a few issues. Some of the gold has worn off of three of the dinner plates and the blue has started to wear off on one of the salad plates. There's a chip on one of the cream soup cups. The rest of the pieces are in good condition with no issues noticed. Please note that the plate stands are not included. Items not picked up after 30 days will be donated. There will be no exceptions. Your satisfaction is important to us. This store is part of a worldwide network of independently owned and operated businesses operating under the iSold It brand name. 16700 N 51st Ave #3 Glendale, AZ 85306. ISold It is the #1 chain of drop-off stores in the U.
ISold It Glendale Arizona has used its best efforts to inspect the item(s) for sale and create descriptions and furnish photographs that fairly and adequately depict the type, condition and image of the goods at the time of sale. The item "Lot 28 Nymphenburg Adonis China Dinnerware 4 Place Settings Plates Cups Saucers" is in sale since Wednesday, November 22, 2017. This item is in the category "Home & Garden\Kitchen, Dining & Bar\Dinnerware & Serving Dishes\Dinner Service Sets".az0170" and is located in Glendale, Arizona. This item can be shipped to United States.